I spent a long weekend in Pasadena from January 21-24th to participate in the 14th Annual Southern California Linux Expo (SCALE14x). 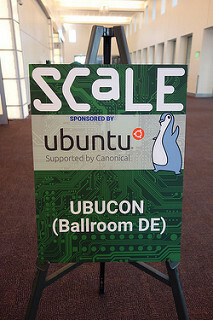 As I mentioned previously, a major part of my attendance was focused on the Ubuntu-related activities. Wednesday evening I joined a whole crowd of my Ubuntu friends at a pre-UbuCon meet-and-greet at a wine bar (all ages were welcome) near the venue. It was at this meet-and-greet where I first got to see several folks I hadn’t seen since the last Ubuntu Developer Summit (UDS) back in Copenhagen in 2012. Others I had seen recently at other open source conferences and still more I was meeting for the first time, amazing contributors to our community who I’d only had the opportunity to get to know online. It was at that event that the excitement and energy I used to get from UDS came rushing back to me. I knew this was going to be a great event. The official start of this first UbuCon Summit began Thursday morning. 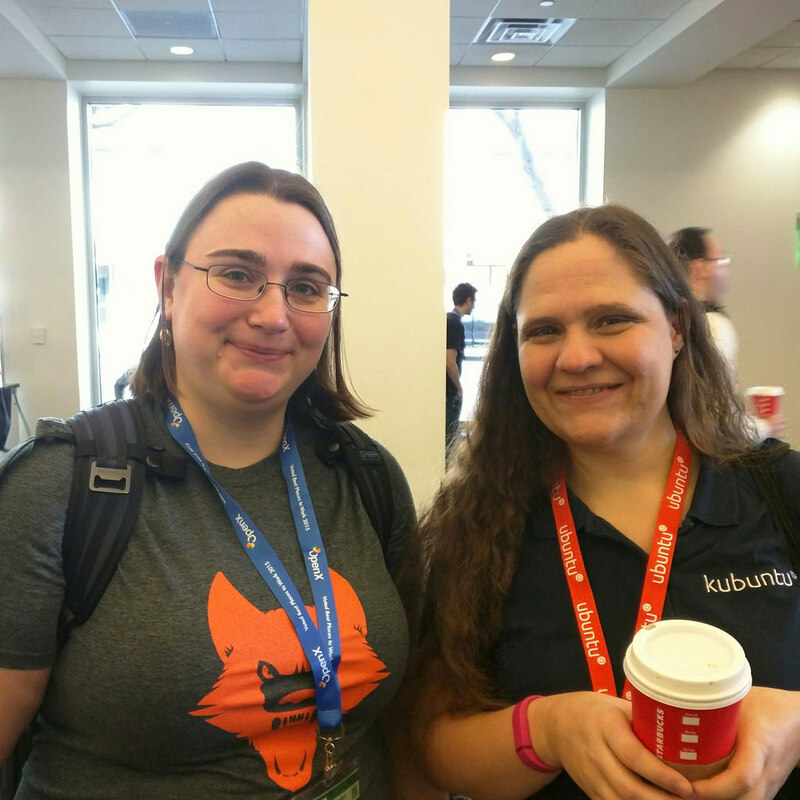 I arrived bright and early to say hello to everyone, and finally got to meet Scarlett Clark of the Kubuntu development team. If you aren’t familiar with her blog and are interested in the latest updates to Kubuntu, I highly recommend it. She’s also one of the newly elected members of the Ubuntu Community Council. After morning introductions, we filed into the ballroom where the keynote and plenaries would take place. It was the biggest ballroom of the conference venue! The SCALE crew really came through with support of this event, it was quite impressive. Plus, the room was quite full for the opening and Mark Shuttleworth’s keynote, particularly when you consider that it was a Thursday morning. 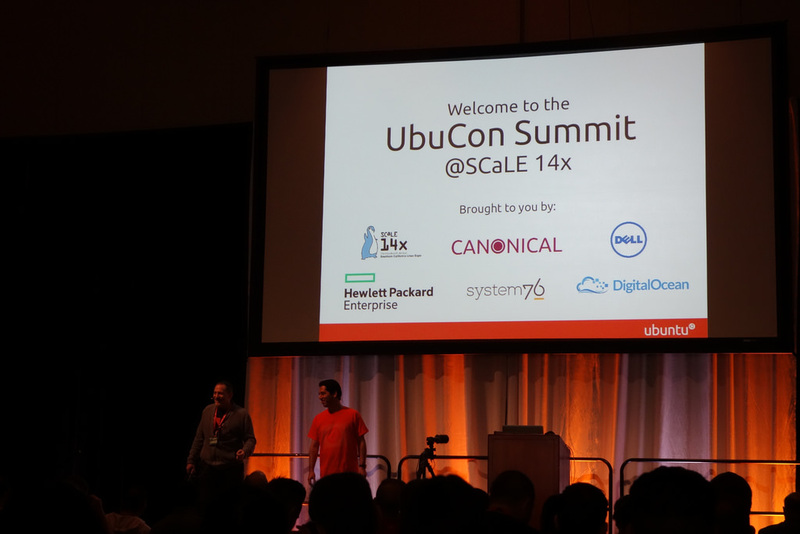 Richard Gaskin and Nathan Haines, familiar names to anyone who has been to previous UbuCon events at SCALE, opened the conference with a welcome and details about how the event had grown this year. Logistics and other details were handled now too, and then they quickly went through how the event would work, with a keynote, series of plenaries and then split User and Developer tracks in the afternoon. They concluded by thanking sponsors and various volunteers and Canonical staff who made the UbuCon Summit a reality. The welcome, Mark’s keynote and the morning plenaries are available on YouTube, starting here and continuing here. Mark’s keynote began by acknowledging the technical and preference diversity in our community, from desktop environments to devices. He then reflected upon his own history in Linux and open source, starting in university when he first installed Linux from a pile of floppies. It’s been an interesting progression to see where things were twenty years ago, and how many of the major tech headlines today are driven by Linux and Ubuntu, from advancements in cloud technology to self-driving cars. He continued by talking about success on a variety of platforms, from the tiny Raspberry Pi 2 to supercomputers and the cloud, Ubuntu has really made it. With this success story, he leapt into the theme of the rest of his talk: “Great, let’s change.” He dove into the idea that today’s complex, multi-system infrastructure software is “too big for apt-get” as you consider relationships and dependencies between services. Juju is what he called “apt-get for the cloud/cluster” and explained how LXD, the next evolution of LXC running as a daemon, gives developers the ability to run a series of containers to test deployments of some of these complex systems. This means that just like the developers and systems engineers of the 90s and 00s were able to use open source software to deploy demonstrations of standalone software on our laptops, containers allow the students of today to deploy complex systems locally. He then talked about Snappy, the new software packaging tooling. His premise was that even a six month release cycle is too long as many people are continuously delivering software from sources like GitHub. Many places have a solid foundation of packages we rely upon and then a handful of newer tools that can be packaged quickly in Snappy rather than going through the traditional Debian Packaging route, which is considerably more complicated. It was interesting to listen to this, as a former Debian package maintainer myself I always wanted to believe that we could teach everyone to do software packaging. However, seeing these efforts play out the community work with app developers it became clear between their reluctance and the backlog felt by the App Review Board, it really wasn’t working. Snappy moves us away from PyPI, PPAs and such into an easier, but still packaged and managed, way to handle software on our systems. It’ll be fascinating to see how this goes. He concluded by talking about the popular Internet of Things (IoT) and how Ubuntu Core with Snappy is so important here. DJI, “the market leader in easy-to-fly drones and aerial photography systems,” now offers an Ubuntu-driven drone. 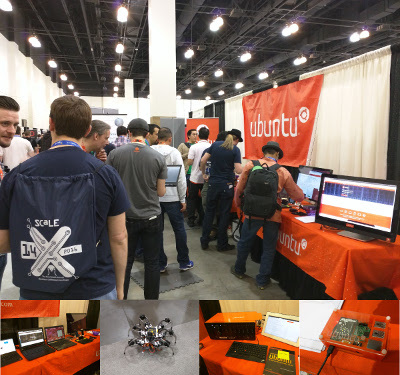 The Open Source Robotics Institute uses Ubuntu. GE is designing smart kitchen appliances powered by Ubuntu and many (all?) of the self-driving cars known about use Ubuntu somewhere inside them. There was also a business model here, a company that produces the hardware and a minimal features set that comes with it, also sells a more advanced version, and then industry-expert third parties who further build upon it to sell industry-specific software. After Mark’s talk there were a series of plenaries that took place in the same room. First up was Sergio Schvezov who followed on Mark’s keynote nicely as he gave a demo of Snapcraft, the tool used to turn software into a .snap package for Ubuntu Core. Next up was Jorge Castro who gave a great talk about the state of Gaming on Ubuntu, which he said was “Not bad.” Having just had this discussion with my sister, the timing was great for me. On the day of his talk, there were 1,516 games on Steam that would natively run on Linux, a nice selection of which are modern games that are new and exciting across multiple platforms today. He acknowledged the pre-made Steam Boxes but also made the case for homebrewed Steam systems with graphics card recommendations, explaining that Intel did fine, AMD is still lagging behind high performance with their open source drivers and giving several models of NVidia cards today that do very well (from low to high quality, and cost: 750Ti, 950, 960, 970, 980, 980Ti). He also passed around a controller that works with Linux to the audience. He concluded by talking about some issues remaining with Linux Gaming, including regressions in drivers that cause degraded performance, the general performance gap when compared to some other gaming systems and the remaining stigma that there are “no games” on Linux, which talks like this are seeking to reverse. Plenaries continued with Didier Roche introducing Ubuntu Make, a project which makes creating a developer platform out of Ubuntu with several SDKs much easier so that developers reduce the bootstrapping time. His blog has a lot of great posts on the tooling. The last talk of the morning was by Scarlett Clark, who gave us a quick update on Kubuntu Development, explaining that the team had recently joined forces with KDE packagers in Debian to more effectively share resources in their work. It was then time for group photo! Which included my xerus, and where I had a nice chat (and selfie!) with Carla Sella as we settled in for the picture. Focus on core opportunities. Ubuntu can run anywhere, but should it? We have finite resources, focus efforts accordingly. Rethink what community in Ubuntu is. We didn’t always have Juju charmers and app developers, but they are now a major part of our community. Understand that our community has changed and adjust our vision as to where we can find new contributors. Get together more in person. The Ubuntu Online Summit works for technical work, but we’ve missed out on the human component. In person interactions are not just a “nice to have” in communities, they’re essential. Reduce ambiguity. In a trend that would continue in our leadership panel the next day, some folks (including Jono) argue that there is still ambiguity around Intellectual Propoerty and licensing in the Ubuntu community (Mark disagrees). Understand people who are not us. The next presentation was my own, on Building a career with Ubuntu and FOSS where I drew upon examples in my own career and that of others I’ve worked with in the Ubuntu community to share recommendations for folks looking to contribute to Ubuntu and FOSS as a tool to develop skills and tools for their career. Slides here (PDF). David Planella on The Ubuntu phone and the road to convergence followed my talk. He walked audience members through the launch plan for the phone, going through the device launch with BQ for Ubuntu enthusiasts, the second phase for “innovators and early adopters” where they released the Meizu devices in Europe and China and went on to explain how they’re tackling phase three: general customer availability. 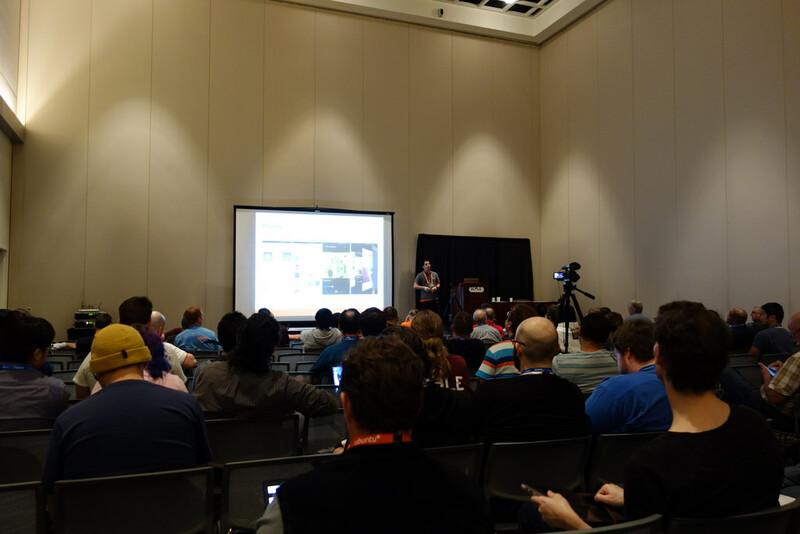 He talked about the Ubuntu Phone Insiders group of 30 early access individuals who came from a diverse crowd to provide early feedback and share details (via blog posts, social media) to others. He then gave a tour of the phones themselves, including how scopes (“like mini search engines on your phone”) change how people interact with their device. 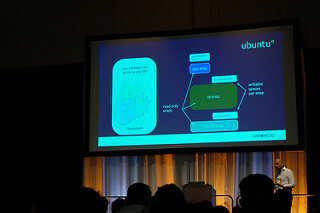 He concluded with a note about the availability of the SDK for phones available at developer.ubuntu.com, and that they’re working to make it easy for developers to upload and distribute their applications. Video from the User track can be found here. The Developer track was also happening, video for that can be found here. If you’re scanning through these to find a specific talk, note that each is 1 hour long. Presentations for the first day concluded with a Q&A with Richard Gaskin and Nathan Haines back in the main ballroom. Then it was off to the Thursday evening drinks and appetizers at Porto Alegre Churrascaria! Once again, a great opportunity to catch up with friends old and new in the community. 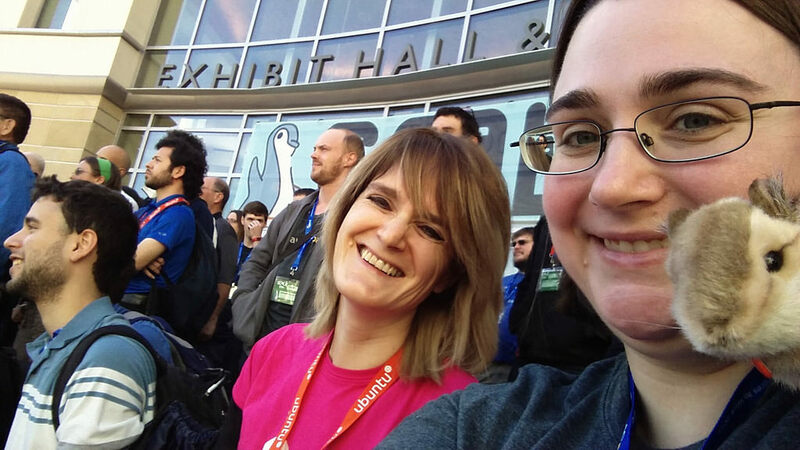 It was great running into Amber Graner and getting to talk about our respective paid roles these days, and even touched upon key things we worked on in the Ubuntu community that helped us get there. 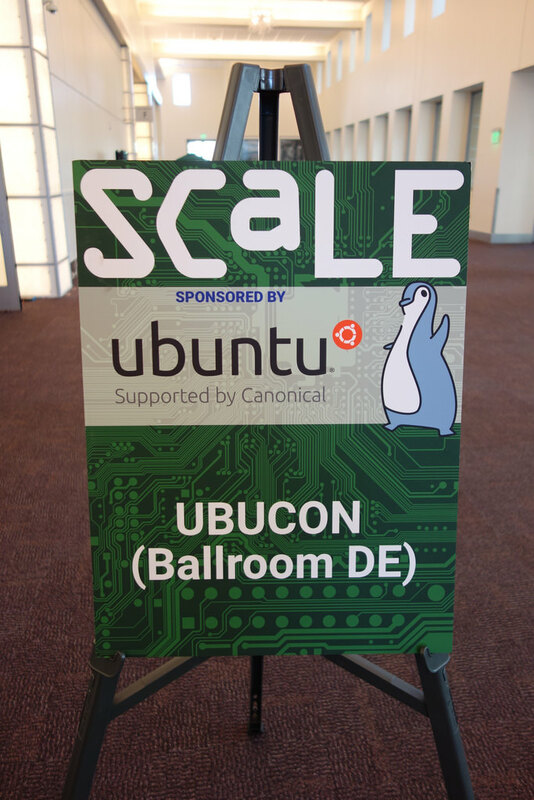 The UbuCon Summit activities continued after a SCALE keynote with an Ubuntu Leadership panel which I participated in along with Oliver Ries, David Planella, Daniel Holbach, Michael Hall, Nathan Haines and José Antonio Rey with Jono Bacon as a moderator. Jono had prepared a great set of questions, exploring the strengths and weaknesses in our community, things we’re excited about and eager to work on and more. We also took questions from the audience. Video for this panel and the plenaries that followed, which I had to miss in order to give a talk elsewhere, are available here. The link takes you to 1hr 50min in, where the Leadership panel begins. The afternoon took us off into unconference mode, which allowed us to direct our own conference setup. Due to aforementioned talk I was giving elsewhere, I wasn’t able to participate in scheduling, but I did attend a couple sessions in the afternoon. First was proposed by Brendan Perrine where we talked about strategies for keeping the Ubuntu documentation up to date, and also talked about the status of the Community Help wiki, which has been locked down due to spam for nearly a month(!). I then joined cm-t arudy to chat about an idea the French team is floating around to have people quickly share stories and photos about Ubuntu in some kind of community forum. The conversation was a bit tool-heavy, but everyone was also conscious of how it would need to be moderated. I hope I see something come of this, it sounds like a great project. With the UbuCon Summit coming to a close, the booth was the next great task for the team. I couldn’t make time to participate this year, but the booth featured lots of great goodies and a fleet of contributors working the booth who were doing a fantastic job of talking to people as the crowds continued to flow through each day. Huge thanks to everyone who spent months preparing for the UbuCon Summit and booth on the SCALE14x expo hall. It was a really amazing event that I was proud to be a part of. I’m already looking forward to the next one! Finally, I took responsibility for the @ubuntu_us_ca Twitter account throughout the weekend. It was the first time I’ve done such a comprehensive live-tweeting of an event from a team/project account. I recommend a browse through the tweets if you’re interested in hearing more from other great people live-tweeting the event. It was a lot of fun, but also surprisingly exhausting! This entry was posted on Saturday, January 30th, 2016 at 3:40 pm and is filed under events, LoCo, tech, travel, ubuntu planet. You can follow any responses to this entry through the RSS 2.0 feed. Both comments and pings are currently closed.